After my exciting journey to the base of the volcano driving from Ubud, I find a small pull-out on the side of the road and decide to park my motorbike. 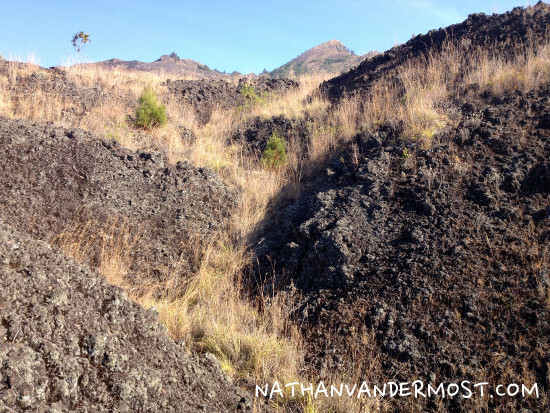 I look around and see a small trail headed towards the volcano and decide to see where it goes. There is no one else in view and it is noticeable dry and hot. After walking on the trail for five minutes it intersects with a larger dirt trail. I pass some small shops selling small snacks and soft drinks. I look ahead and see a large guided group coming down the trail. In my previous post I wrote that I had read about other sole climbers that had negative interactions with guides.I wanted to avoid any potential negative interactions. 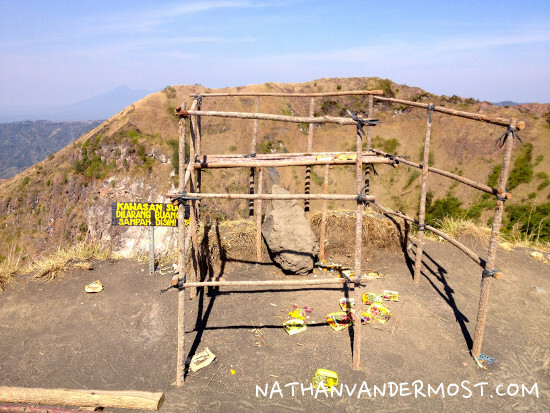 Based on all the research that I had done, climbing mount Batur by yourself is not illegal. 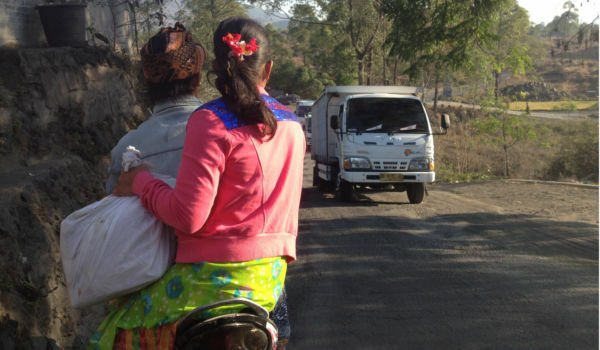 But locals may try to persuade you otherwise.While passing the guided group the guides say, “hello! Where are you going?” As if I am lost?.?. I ignore them and keep walking. They did not say anything else and I kept walking. About 20 minutes into the hike, the trail comes to a “Y.” The main trail turns right while a smaller trail goes straight. I take the smaller trail as I want to avoid any other large guided groups. The foliage in the area is dry and sparse whereas the foliage closer to the ocean is green. 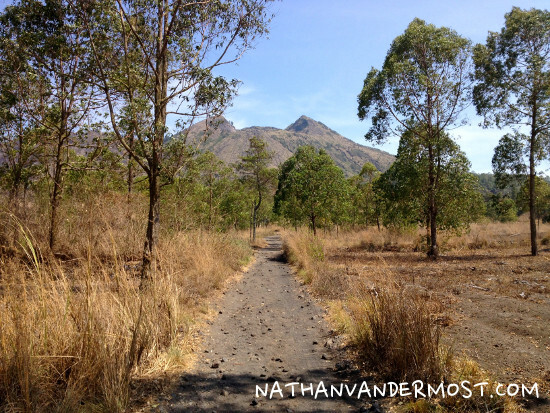 Since there is not a lot of plants in the area and it was a beautiful day I was able to see the summit of the volcano and the main trail that I had deviated from. 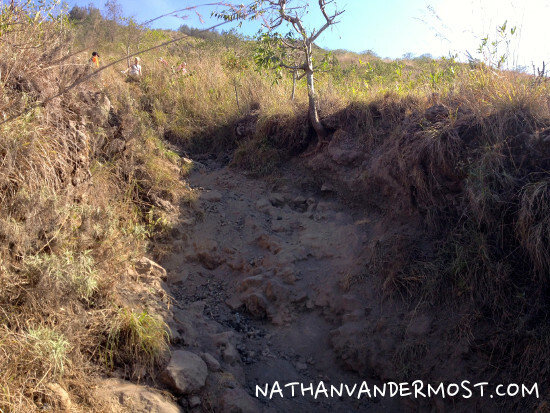 The alternative trail started to tapper off and led me to small gullies with sharp volcanic rocks lining the bottom. 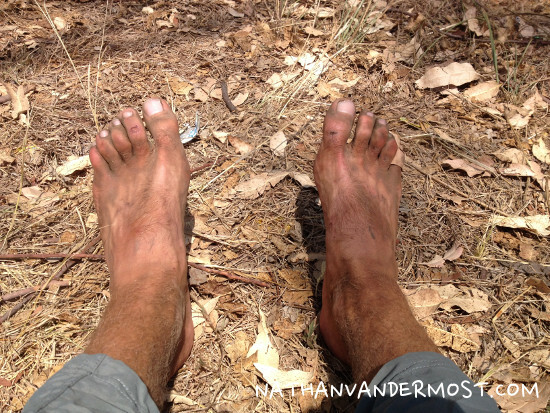 Fortunately, I was wearing appropriate footwear but if I was wearing sandals I would have torn up my feet. 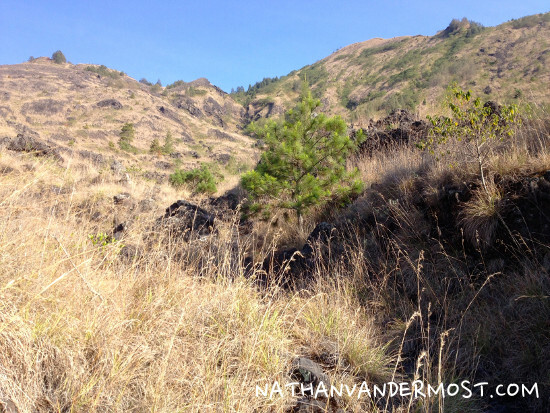 Since the weather was sunny and visibility was fantastic, navigating off-trail was easy. I noticed a steep section of the main trail and decided that I would try to merge onto that section of trail. 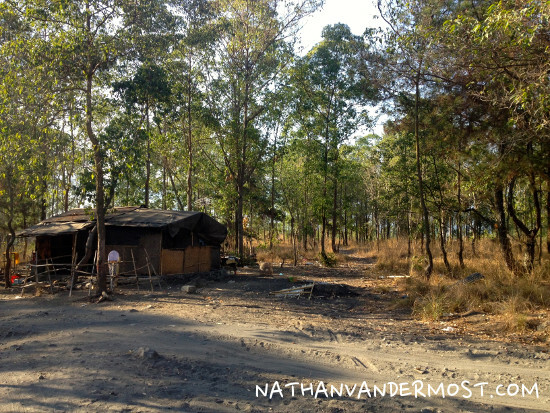 I left the motorbike at 7am and as the day progressed it got hotter and hotter, as the sun rose. There is no protection from the sun on the trail so I would highly recommend that you have sunscreen, sunglasses, a hat and plenty of water as there is no water along the trail. The base of the steep section of trail is very evident as the trail narrows significantly and the angle of the trail gets steep. There was a group of people waiting at the bottom when I arrived. The group was taking a break and drinking some water as I passed them. 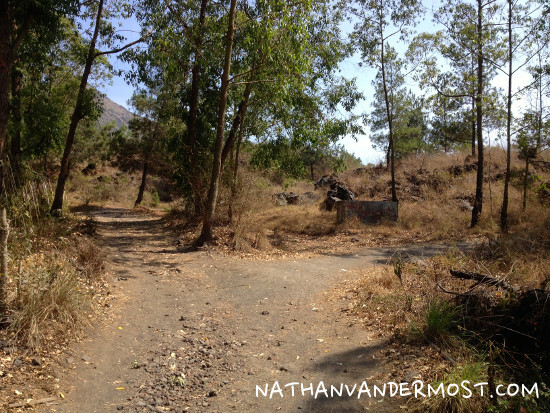 The steep section of trail is not technical but you do have to be wary of loose rocks and gravel. Since Most of the guided groups had already descended the trail. I found myself hiking alone and not seeing many other people which made it more of a wholesome experience. 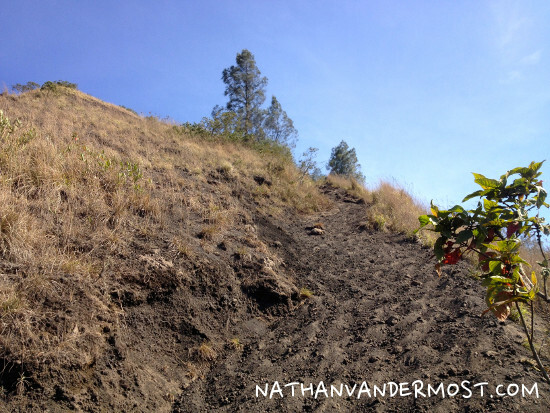 After the steep section, the trail flattens out and you reach a false summit. There are monkeys and stray dogs that are roaming in the area but I did not feel threatened by their presence. There is also a cement structure that serves warm drinks and other treats but was closed by the time that I passed it. 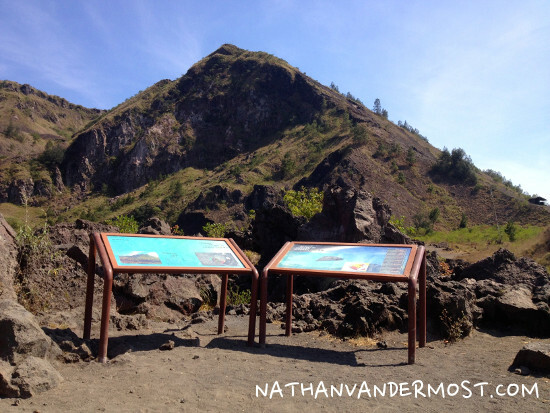 There is an opportunity to look into the caldera which is the crater of the volcano. 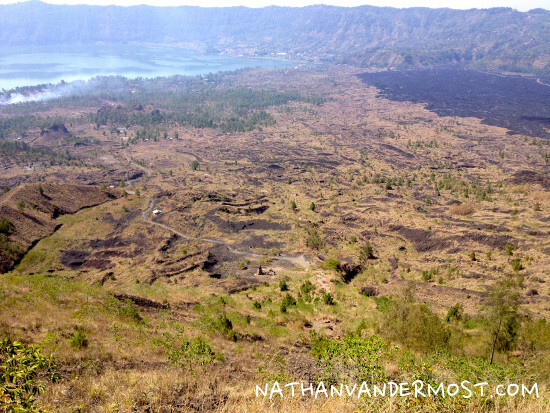 Mt Batur is still an active volcano and when I looked into the creator, I saw steam rising from a corner. After walking around the area, I continued on the trail. The last section of trail before the summit had pumice on the trail and made the last section of trail the most difficult; because for every step you take, you go down half a step. 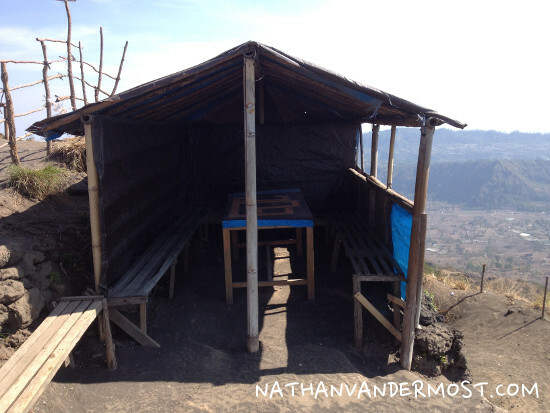 As I was hiking, I passed a small tent structure with an older women selling tea, coffee, drinks and snacks. 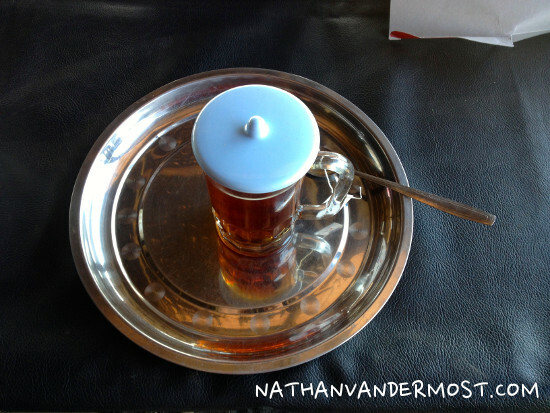 She asked, “Do you want some hot drinks?” I though for a moment and responded, “Maybe on the way down.” I kept going. 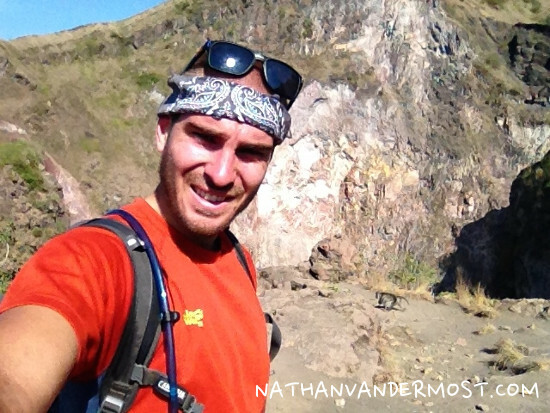 The last section of trail was the most difficult because it has difficult terrain, it was later in the day, and I was fatigued from hiking. Finally, I reached the summit! The top has several tent structures to stay under for protection from the elements. The summit is marked with flags and has a sign with the height of the summit. I was all alone and was able to take in the beautiful scenery. There were only a few clouds in the sky and the view was spectacular. 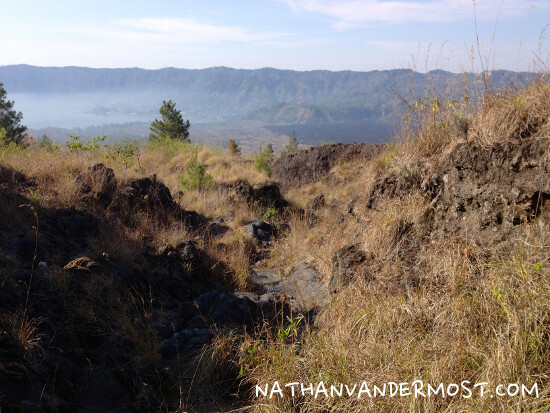 I did not spend too much time at the summit as I still needed to descend and drive back to Ubud. 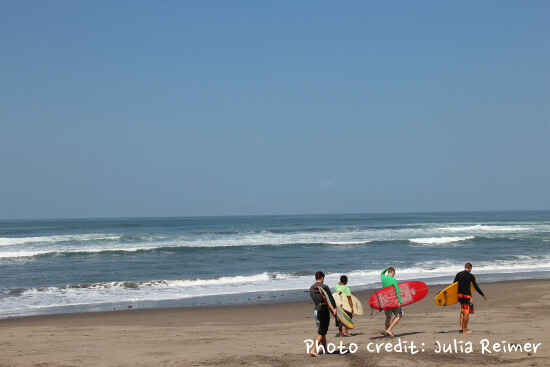 Then, pack my things and drive back to Canngu as my surf camp would resume the following day. 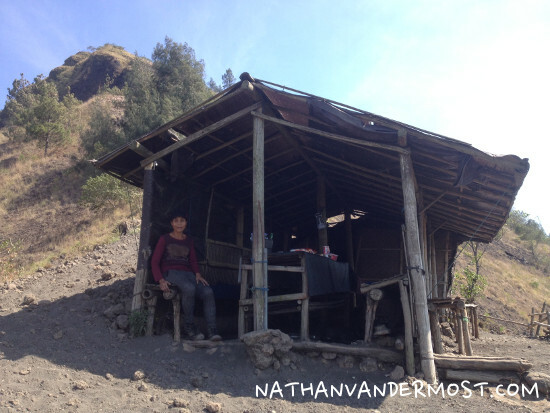 On my way down I stopped at the make-shift tent for a cup of tea with the elderly lady. Her English was quite impressive as I assume she speaks English with many foreigners. I asked her many questions and she had an amazing story, selling hot drinks, soft drinks and snacks is what she does for a living. She climbs the volcano everyday, leaving the trailhead at 3am. 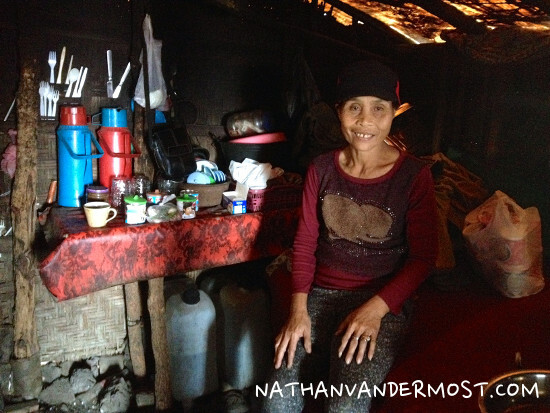 In addition, she hauls the drinking water that is used for the hot drinks, balancing it on her head! 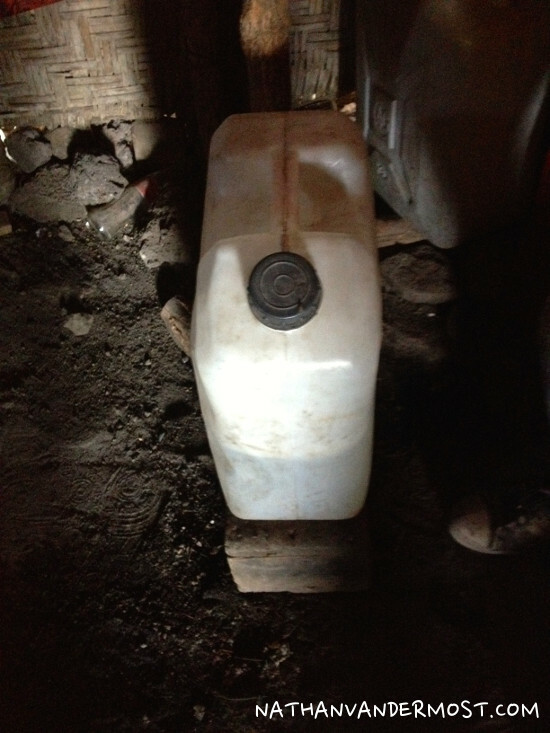 I ask if I can see the jug of water that she hauls up the volcano everyday and it is roughly a 5 gallon plastic container. She moves it from where it was being stored so that I can see it in its entirety. I thank her and offer to move the water jug back to where it was being stored. I attempt to move it and I am stunned how heavy it is! Whoa. This lady hikes this volcano everyday with this on her head! WOW! After enjoying my tea, I ask her how much it is and she tells me that it is 10,000 rupiah or $0.83USD. I hand her 20,000 rupiah and tell her that I do not need change. She is so grateful that she gives me a hug. I am more than happy to pay it and thank her for her stories. I ask her if I can take a picture and continue my descent. Descending the volcano goes really quickly and I stay on the main trail as there are very few people that try to climb the volcano during the day. 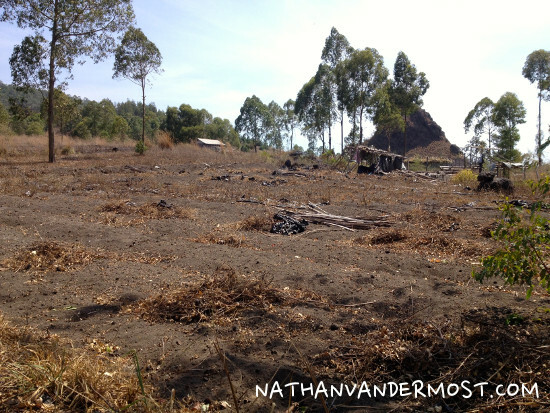 As I am closer to the bottom, I pass coffee farms and assume it is due to the lack of water as the area is extremely dry. I see several locals working the land and cannot imagine doing manual labor in the heat. I feel out of place because as a local, seeing foreigners hiking up a volcano for fun would seem like a silly proposition. 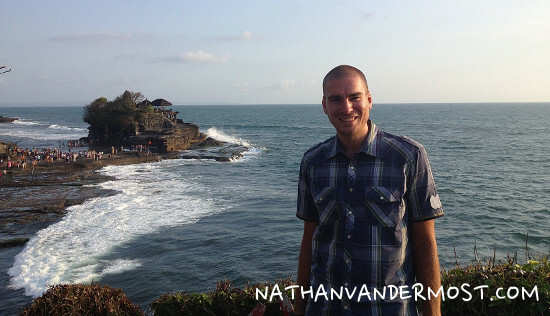 I make it back to my motorbike with no problem and start the drive back to Ubud. 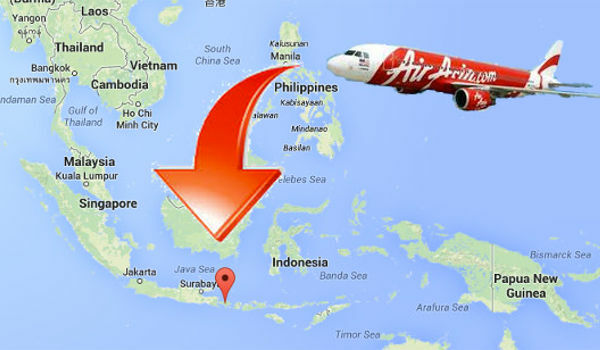 The drive back to Ubud goes smoothly and I am able to pack my things and make it back to Canngu at the beach by 3:00pm. Whoa! What a day! Now I need to rest up for camp! Loved this read. Attempting the climb tomorrow. Especially loved the meeting with the lady and the huge water tank; I wonder if she’ll be there tomorrow! Hey fellow climber. We also want to do the tour on our own but cannot quite figure out where the trail starts. Thanks Jonny! I hope you had a great climb!